Station Hollywood: Kazi Nazrul Islam was remembered with Manobendra songs. Kazi Nazrul Islam was remembered with Manobendra songs. Remembering Kazi Nazrul Islam by Manobendra Mukherjee’s songs. Poet, composer and singer Kazi Nazrul Islam is remembered on his death anniversary on 29th August, 2017. He was considered to be one of the greatest Bengali talents after Rabindranath Tagore who created songs and poetry during colonial period. He was in fact called bidrohi kobi, meaning rebel poet. Manobendra Mukherjee, the genius of Bengali classical songs had made Nazrul Islam immortal by singing more than 500 Nazrulgeeti during his lifetime. Manobendra Mukherjee died in 1992, but before that whatever records he made in nazrulgeeti still remains the Geeta for new singers who specialize in Nazrulgeeti. Some of the songs that people remember include “eto jol o kajol”. Manobendra showed his classical jugglery in the song “bou katha kou katha kao abhimanini”. The song which Manobendra Mukherjee sang in many concerts included “bagichay bulbuli”. The other song which was very popular in the 70s included “jare haat diye mala gethe”. The same song was also recorded by legendary singer Pandit Ajoy Chakravarty in his own andaz. Manobendra also was brilliant in the song “timir bidary”. Manobendra’s song “noyon bhora jol go tomar aanchol bhora chul” became extremely popular in 80s. His other hit songs included “jhumko lotar chikon”, “keno kaden poran”, “kache amar niba”, “saat bhai chompa”, “aso priyo aro kache”, “jani amar sadhona”, “amar noyone noyon”, “jabar belay fele”, “mor priya hobe”, “sondha se godhuli”, to name a few. 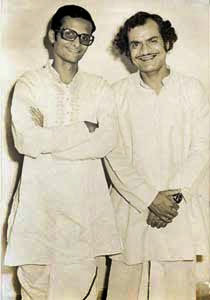 Few of Manobendra’s songs had been sung one after the other by other musical giants. For example “sawono rate Jodi”, had been sung by Manobendra. It was also sung by Manna Dey in the film Devdas, where Uttam Kumar gave lips in the song. Besides Manobendra Mukherjee’s song “ado ado bol” was also recorded by genius singer Mohammad Rafi later on. One article is too small to highlight Manobendra Mukherjee’s landmark songs composed by Nazrul Islam, but along with Juthika Roy, Dhirendra Mitra, Firoza Begum, Kamal Dasgupta, Manobendra Mukherjee had glorified Nazrulgeeti in his own classical andaz. The songs should be preserved.